The ‘Pink City’ of Rajasthan or Jaipur is a major tourist destination of the country, which is surmounted by Rajputana palaces, forts, cultural ethnicity, princely ambiance and amazing colorful markets, scattered to the entire land of the pinkcity. In Jaipur, one can see a very beautiful and lively picture of the Pink city showing its hospitality which provides one a comfortable vocational spot filled with royal appearance as well. Jaipur is one of the most important destinations on world-renowned golden triangle tour of India. There are several factors that attracts tourist to the land of Jaipur, one of them being Jaipur Decoratives. One should be aware of the fact that the state Rajasthan is the region which shares the moment of pride and honor because of its enriched heritage and culture all over the world. Jaipur, which has the title of the capital of Rajasthan, is one place where the fusions of traditions along with modernization are seen. Jaipur embraces a royal past drenched completely in extravagance. The city possesses many lavish palaces including several legends, enchanting travelers and localities as well. for Its monuments, palaces, forts, temples and gardens. All these places are the bookmarks of the erstwhile traditional era, where royalty was once lived with complete power. Apart from folk entertainment, nowadays puppets are also used in interior decoration of home. The decoration of the room seems to be incomplete with puppets placed in the room. The puppets are available in the markets of Jaipur. Puppets can also be given in the form of gifts to your friends. These puppets are very famous in all the countries and also become a shopper’s delight for tourists. The designs, patterns and the animal and bird motifs on blue pottery are inspired from the Mughal period. The products includes flower vases, plates, surahis, small dishes, coasters, trays, door knobs, fruit bowls and beautiful tiles with hand painted flower designs. This is also considered as one of the decorative things in Jaipur. The fountain in the middle of the gardens or halls in which the water cascades down looks very beautiful if it is made from marble. Bagru and Sanganer towns of Jaipur are famous for hand printed textiles. Their prints are known as Bagru Print and Sanganer Print and both are famous for exclusive patterns of textile design and prints. Bed sheets, cushion covers, dress material of hand printed textile is also in demand from ancient period. The Zari sarees of Jaipur are the best ever outlook for the wearers. Zari sarees of Jaipur are having greater fame in Rajasthani women. These sarees are the best options among the hand work sarees as they are the best outlook wears for women. 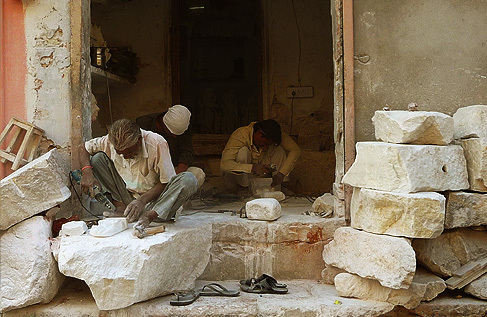 There are thousands of artisans in Jaipur who are able to work on the thinnest and the sleekest Zari material. Handmade paper boxes also have variety of colors and designs. These boxes come in variety of shapes like heart, cube, hexagon and many other shapes are also there. These are mostly used by people for keeping jewelry, gift enclosures etc. The jewelry of Jaipur, Rajasthan is mostly in demand in many markets. The Lac work, thewa jewellery, Kundan work, all are done in a fabulous way. Mughal influence can also be noticed in the jewelries of Jaipur. From ancient times onwards this city is known for its fantastic designed jewelry. The jewelry of Jaipur still maintains the charm and beauty in it as it was in medieval era. The art of jewelry has flourished since ancient times. The colorful and pleasing costumes and jewelry of Jaipur are constantly in demand throughout the year mentioning the significance of Jaipur Decoratives in every part of the world. There are many Jaipur decorative items available in the other markets of Jaipur. Items ranges from statues, mirror frames, betel nut boxes, sindoor holders etc. these all are available at Choti Chppad and nearby areas.